Two fragment reassembly projects were prepared for the e-Pedius application. The first project called “Four Seasons” is a test case for which the right fragment composition is known. The second project called “Turkish Cat” is a true, large and demanding project with many reassembly tasks. The four painted medallions were discovered in 1985 in a stairwell of a residential building on Moša Pijade Street 34 (now Kolodvorska Street) in Ljubljana, Slovenia, scheduled for demolition. 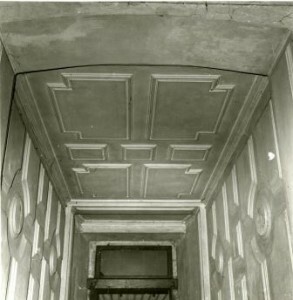 The wall paintings (oil on plaster), once part of ornamentation of the coffered staircase, were found beneath whitewash. All four medallions were removed, cleaned of whitewash and grime, and the paint layer stabilized. Scenes thus revealed depict the four seasons. Description: 4 round medallions with a personification of the four seasons. “Turška Mačka – The Turkish Cat” project was named after an old inn in Celje, Slovenia, under which a rich Roman-period archaeological site was discovered in 1978. 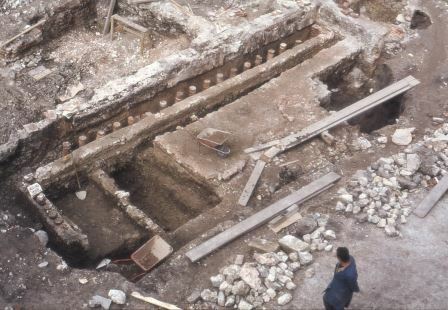 The residential room, part of the Roman town of Celeia, was built in the first century A. D. The elongated room measuring 4 by 13 m had hypocaust heating, floor paved by a black-and-white mosaic with a simple rosette pattern, and walls with rich fresco ornaments. The majority of fragments are of different colors (such as white, red, green, blue, black, and yellow), whereas on some various motifs, such as animals, flowers, and a lot of different patterns can be recognized. Fragments consist of several mortar layers which differ in their thickness and sometimes in color. The unearthed fragments, now in the Restoration Centre of the Institute for the Protection of Cultural Heritage of Slovenia, already underwent the first restoration steps a few years ago. So far, three segments approximately 200 cm in length and 30-90 cm in width have been reconstructed. 9521 fragments remain, kept in 166 cases. Due to the extent and exceptional quality of the painting, a rarity in the territory of Slovenia, a decision has been made to attempt to reconstruct it entirely and make a full presentation. Date/period of origin: 1st to 2nd century A. D.